Abstract: Data processing for large-scale GNSS network is faced with increasing challenges as both the number of tracking stations and navigation satellites continuously increases. It has been shown that converting original carrier phase observations to carrier range observations is one of the valid approaches to improve the computing efficiency of data processing. In this paper, a new method to generate the carrier range observation is presented, correcting the ionosphere-free combination of carrier phase using the estimation of un-difference ambiguities obtained in the PPP solution with fixing between-satellite single difference ambiguities. Experiments with GPS data from the crustal movement observation network of China (CMONOC) during day 1-30 of year 2017 are conducted to validate the proposed approach. It is demonstrated that, using the carrier range observation, the computation time for the network with 252 stations is less than 20 minutes. 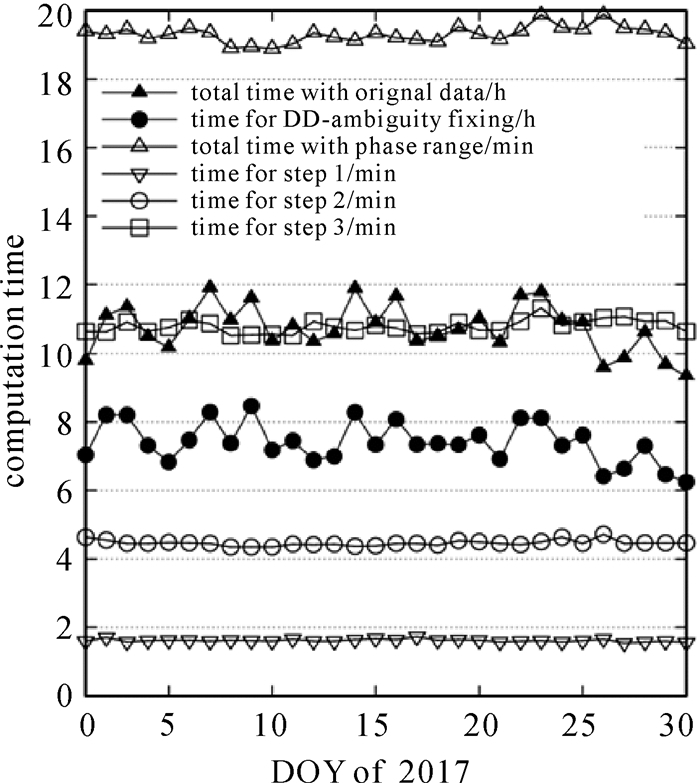 If the original phase observations are used, it takes about 11 hours, nearly half of which is spent for resolving integer double difference ambiguities. Excluding the 12 abnormal stations, the monthly coordinate repeatability of the 240 stations are 0.74, 0.85 and 2.53 mm on average respectively in the directions of N, E and U, which are slightly better than those with original phase data. We also discuss the difference of integrated network solutions with original phase and carrier range. Using the concept of adjustment model with constrain condition, a unified formula of observation model is presented to interpret the principle of integrated network solution with carrier range generated with various integer ambiguity resolution strategies, i.e. 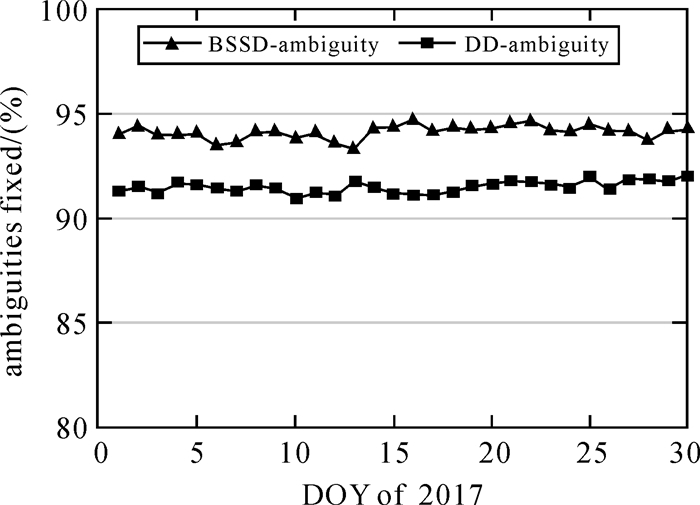 resolving zero-difference, double-difference and between-satellite single-difference integer ambiguities. It is concluded that the effect of network solution with carrier range observation is theoretically equivalent with the traditional approach with original phase data. 占伟, 武艳强, 章力博, 等. 陆态网络GNSS连续站分区解算方案的对比分析[J]. 地震, 2014, 34(4): 136–142. 宋力杰, 欧阳桂崇. 超大规模大地网分区平差快速解算方法[J]. 测绘学报, 2003, 32(3): 204–207. BROCKMANN E. Combination of Solutions for Geodetic and Geodynamic Applications of the Global Positioning System (GPS)[D]. Berne: Astronomical Institute, University of Berne, 1996. 陈正生, 吕志平, 崔阳, 等. 大规模GNSS数据的分布式处理与实现[J]. 武汉大学学报(信息科学版), 2015, 40(3): 384–389. CHEN Zhengsheng, LÜ Zhiping, CUI Yang, et al. 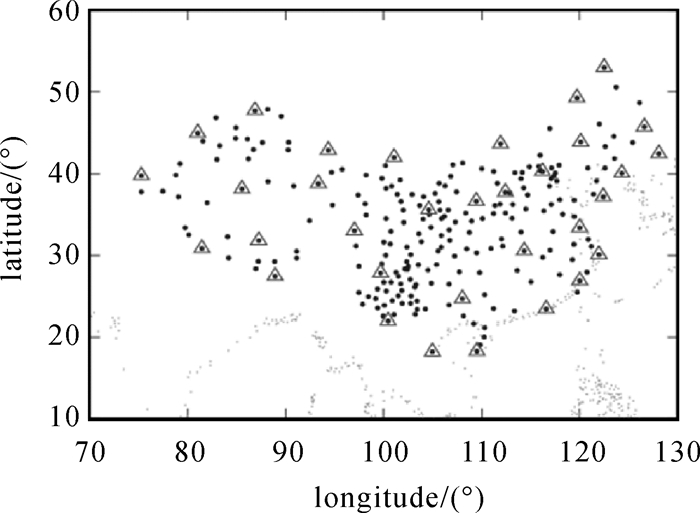 Implementation of Distributed Computing with Large-scale GNSS Data[J]. Geomtics and Information Science of Wuhan University, 2015, 40(3): 384–389. 崔阳, 吕志平, 张友阳, 等. 一种GNSS大网数据快速高效处理策略[J]. 大地测量与地球动力学, 2015, 35(3): 383–386, 411. CUI Yang, LÜ Zhiping, ZHANG Youyang, et al. 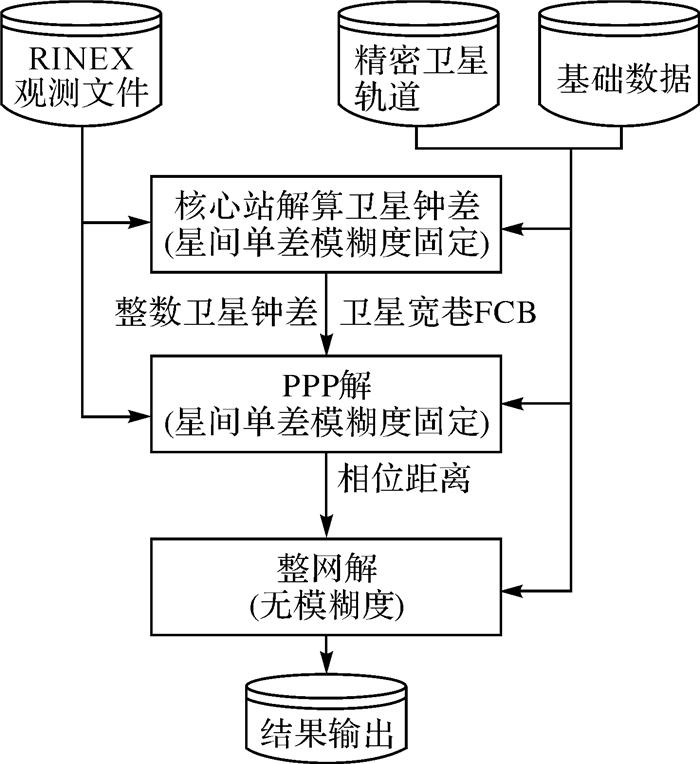 A Strategy of Large GNSS Network Data Rapid and Efficient Processing[J]. Journal of Geodesy and Geodynamics, 2015, 35(3): 383–386, 411. 崔阳, 吕志平, 张友阳, 等. 大型高精度GNSS基线向量网并行抗差估计[J]. 测绘学报, 2015, 44(5): 495–502. BLEWITT G, BERTIGER W, WEISS J P. Ambizap3 and GPS Carrier-range: A New Data Type with IGS Applications[C]//Proceedings of IGS Workshop and Vertical Rates. Newcastle, UK: [s.n. ], 2010: 28. 阮仁桂. SPODS软件GPS/GNSS网解的模糊度解算方法[J]. 测绘学报, 2015, 44(2): 128–134. 魏子卿, 阮仁桂, 贾小林, 等. 卫星定位定轨系统SPODS:理论与测试[J]. 测绘学报, 2014, 43(1): 1–4. 阮仁桂, 魏子卿, 冯来平. 卫星钟差解算及其星间单差模糊度固定[J]. 测绘学报, 2018, 47(7): 916–923. 阮仁桂, 李伟峰, 贾小林. 整数精密单点定位原理及其动态定位精度分析[J]. 测绘科学与工程, 2017(5): 9–14. RUAN Rengui, LI Weifeng, JIA Xiaolin. Principle of Integer Precise Point Positioning and Accuracy Analysis of Its Kinematic Positioning[J]. Geomatics Science and Engineering, 2017(5): 9–14. MCCARTHY D D, PETIT G. IERS Conventions (2003)[R]. Germany: International Earth Rotation and Reference Systems Service (IERS), 2004. BÖHM J, NIELL A, TREGONING P, et al. Global Mapping Function (GMF):A New Empirical Mapping Function Based on Numerical Weather Model Data[J]. Geophysical Research Letters, 2006, 33(7): L07304. BIERMAN G J. Factorization Methods for Discrete Sequential Estimation[M]. New York: Academic Press, 1977: 241. DE JONGE P J. A Processing Strategy for the Application of The GPS in Networks[D]. Delft: Delft University of Technology, 1998: 238.